The first superhero film isn't likely what you expect, and the influence it has had will surprise you. The superhero movie trend isn't going to end anytime soon, but the superhero genre does have a beginning. Movie geeks love a great argument, and what was the first superhero movie to grace the big screen is a doozy of an argument. It may come as a surprise, too, that superhero movies weren’t all that popular in the early days of cinema. Hollywood told a variety of stories, some featuring a hero that saved the day (sans tights and a complicated, otherworldly backstory). They also didn’t really use comics as source material for features in the Golden Age of Hollywood. There were superhero-like movies, though. It’s important to know that a superhero doesn’t have to come from another world, like Superman. If Marvel has taught us anything, it’s that (Hello Black Widow and Hawkeye.). As the day approaches where yet another superhero film is hitting theatres — Aquaman — it’s a perfect time to trace the origins of superhero movies and review the first superhero movie ever made and the superhero movie trend that followed (much later). Merriam Webster says the first known use of superhero occurred in 1899. The word wasn’t popular until the mid-1960s, which just happens to coincide with the release of the first Batman movie, Batman: The Movie, based on the campy television series. Adam West (Batman) and Burt Ward (Robin) take on a whole host of enemies, including sharks, Catwoman, The Joker, and The Riddler. As a serial film starring René Cresté, Judex’s 12 parts were shown together. And the plot is atypical superhero movie fare wherein Judex must avenge his father’s death by taking down an evil banker, while also falling in love with a woman who’s complicated, and encountering a female superhero whom he teams up with to take down the banker’s cronies. Debate it all you want, but come on, Judex is clearly the first superhero movie ever. It even spawned a sequel, Judex’s New Mission, and remakes — the backbone of the superhero genre. And yes, it did screen in the United States in 1917, meaning the influence over future pop culture superhero creations can be seen (even if unsubstantiated by the creators). If you’re up on film history, the fact that a French director made the first superhero movie didn’t come as a surprise — the Lumière brothers do get credit for making the first motion picture (yet another debatable topic for another time). 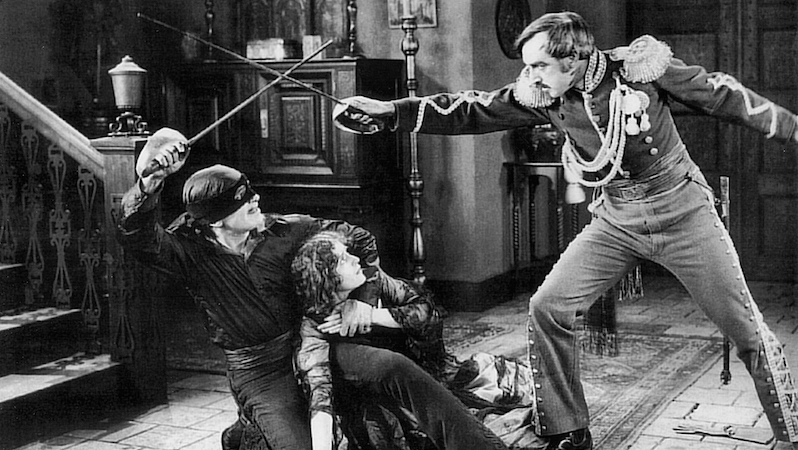 American filmmakers love a great hero story, too, and in 1920 the first American superhero movie debuted, The Mark of Zorro starring Douglas Fairbanks. The Mark of Zorro, a silent film taking place in the early 19th century in California, is based off the short story “The Curse of Capistrano” by Johnston McCulley that pulp magazine All-Story Weekly published. The movie shot Fairbanks to a new level of stardom and ushered in a new hero for movie audiences, the swashbuckling adventurer, aka superhero. Zorro is a two-faced character that pretends to be in cahoots with the evildoers but in reality, he’s fighting evil tyrants while donning a purple cloak and black mask. And the swordsmen skills he possesses are top-notch, so much so that he marks his victims with a Z and a laugh. Do we know another caped crusader who enjoys branding evildoers? Silly question, right? The Mark of Zorro had a sequel, remakes, and reboots. The character’s popularity waned after the 1970s until Antonio Banderas took up the cloak and mask for 1998’s The Mask of Zorro, also starring Catherine Zeta-Zones. Before then, though, a man from another planet would usher in the comic book superhero movie age. 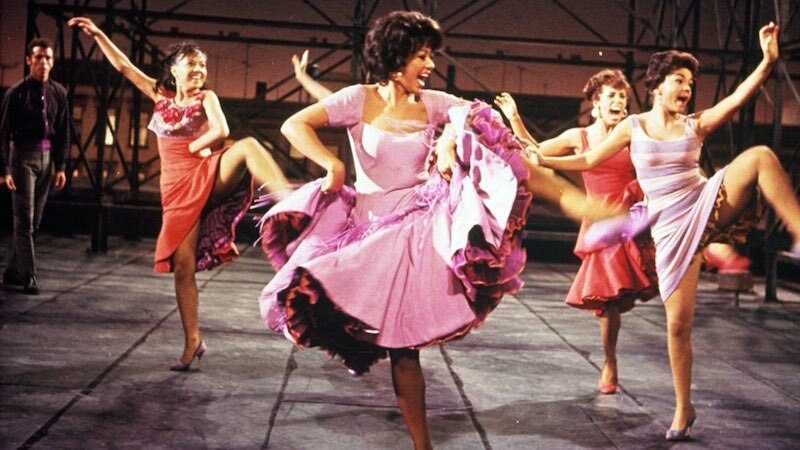 A great deal changed in the 1970s in terms of movies — the studio system had collapsed and censorship lessened, to name just two. A new genre was created: Blaxploitation (Shaft, Sweet Sweetback’s Baadasssss Song), cult films became more popular, and the American New Wave emerged (the “Movie Brats”). 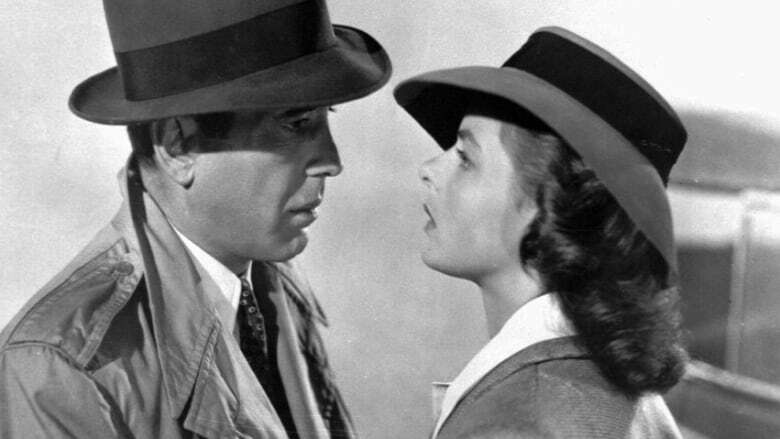 And something that’s never gone out of style came to be: blockbuster movies. Superhero movies didn’t play a large part in the 1970s, aside from Abar, the First Black Superman which Director Frank Packard made as part of blaxploitation (it’s brilliant). Oh, and that movie starring Christopher Reeve as Superman. Between 1966’s Batman: The Movie and 1978 there wasn’t a DC comic book adapted for the screen. Superman would change that, forever. 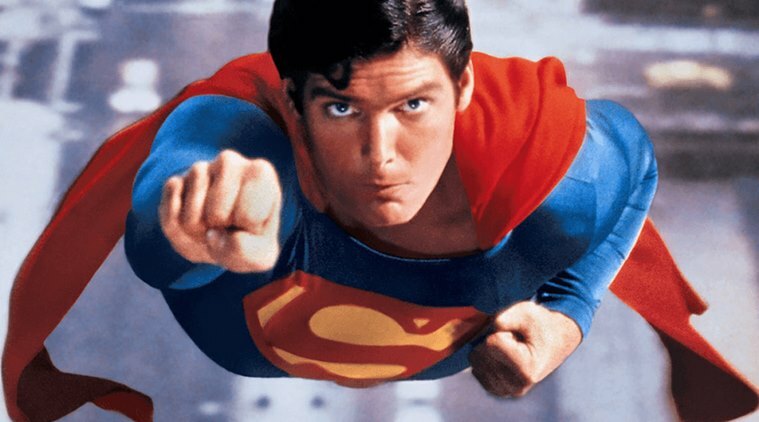 It spawned multiple sequels, made a star out of Reeve, made oodles of money, and even gave a woman a shot at superhero stardom with the less-than-stellar Supergirl in 1984. You could even argue that, while it took over ten years, Superman’s success is what made Tim Burton’s Batman (1989) possible, even if the sequels were a nightmare. And don’t even try to discount the connection between Judex and Batman, or if you please, The Shadow. 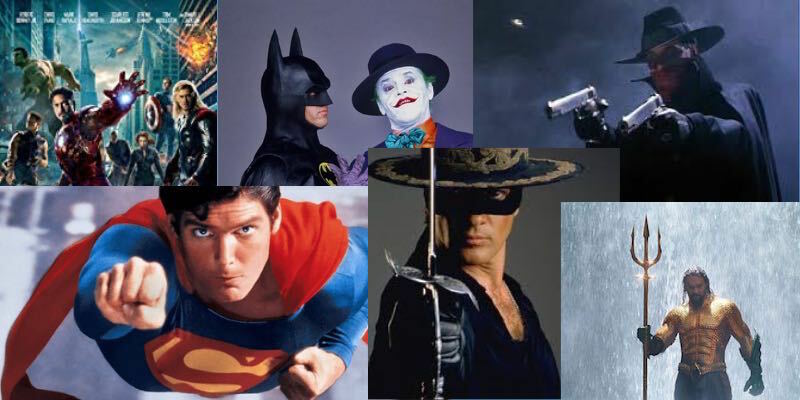 The ideal partnership of blockbuster movies and superheroes made the 1980s and 1990s so much fun. Moviegoers got Flash Gordon, The Toxic Avenger, RoboCop, The Spirit, and Tank Girl. To this day these films are worshipped in cult circles (my favorite is The Toxic Avenger). Plus, The Shadow, Judge Dredd, Teenage Mutant Ninja Turtles, Darkman, The Phantom, Spawn, The Crow: City of Angels, and more. Since Superman and later Burton’s Batman, there’s been no shortage of superhero fare, but when Marvel decided to cash in on its properties, the movie world got saturated. Sit back and think for a moment when the last summer movie season that didn’t have a Marvel comic book movie adaptation as a tent-pole movie occurred. Then consider any season of the year that hasn’t had a Marvel movie premiering in the past decade. You likely can’t. 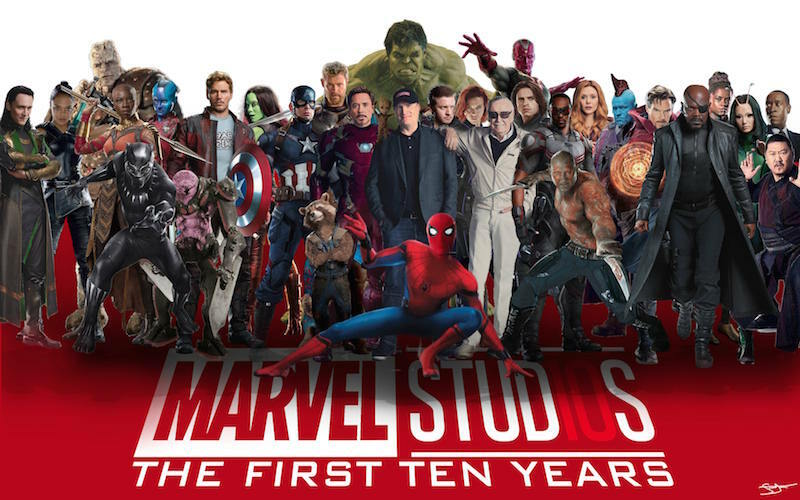 From X-Men to Spider-Man to Iron Man to Thor to Captain America and The Avengers, Marvel has ruled the superhero movie genre for over a decade. DC Comics keeps up, kind of, and is trying to make the best of its Justice League characters — Wonder Woman being the most promising. 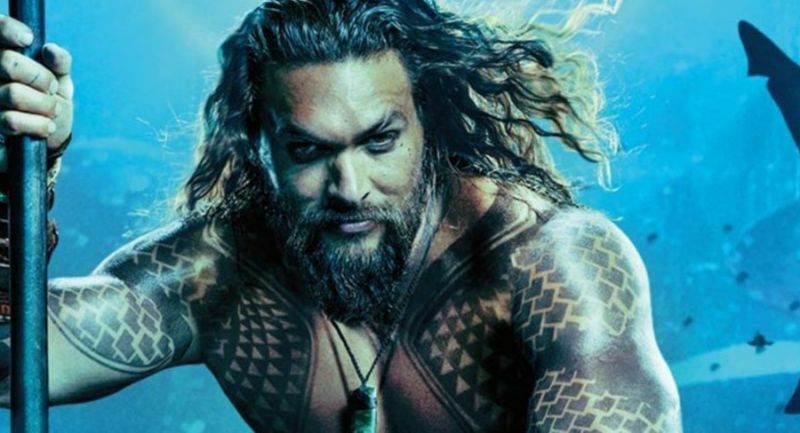 Aquaman, a movie no one thought would ever get made (it’s a tad awkward with the necessary underwater action), is the latest DC comic book adaptation that hopes to capture the 2018 Holiday Movie Season. Will it? Your guess is as good as mine. But one thing is for certain: Regardless of whether Aquaman breaks the bank or tanks, superhero movies will continue to be made. They may be influenced by Judex, the first superhero movie (yup, I’m not bending on my argument), or not, but they all have the French vigilante to thank for making it okay to wear a disguise and seek justice outside the confines of the law.